It’s been reported on the BBC Sport website that Newcastle United manager Alan Pardew would like to re-sign Andy Carroll when his loan deal with West Ham United runs out at the end of the season. Magpie’s manager Pardew sold Carroll to Liverpool for £35 million back in January 2011 but would welcome the opportunity to buy him back. One thing’s for certain, Newcastle won’t be offering anywhere near the £35 million fee Liverpool paid for the 23 year old striker. Carroll clearly isn’t valued by new Liverpool manager Brendan Rodgers, as his style of play doesn’t fit in with Rodgers possession game. But given Liverpool’s lack of strikers, Rodgers decision to let Carroll go out on loan to West Ham has been widely questioned. It could be argued that the way Liverpool has dealt with Carroll has undermined his value. If Carroll does leave Liverpool, as looks increasingly likely if Rodgers stays in charge, how much will clubs be prepared to pay and how much of a loss will the Liverpool owners be prepared to suffer? Will Andy Carroll be back in a Newcastle United shirt next season? 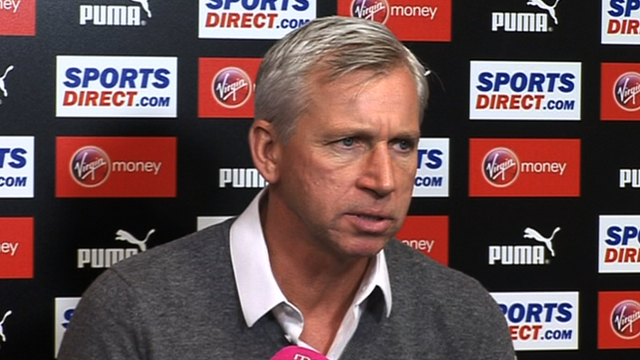 It seems Alan Pardew certainly hopes so. Here’s the link to the full report – BBC Sport. This entry was posted in News, Premier League and tagged football latest, liverpool, newcastle united, premier league on November 10, 2012 by soccerjerseyplus.